So last post, I mentioned about the installation of the new battery charger, which is fed from 240V mains. Over the last few days this charger has held the batteries at a rock-solid 14.4V. Not once did the batteries drop below that voltage setpoint. So good in fact, the solar charger does no work at all. By the way, this is what the install looks like. I promised pictures last post. I will eventually move this to a spot on the back of the rack, but it can sit here for now. Ultimately, the proper fix to this will be to have the mains-powered charger power off when the sun is up. On the DC output connector, the two rightmost screw terminals go to an opto-isolator that, when powered, shuts off the charger, putting it into stand-by mode. This was one of the reasons I bought this particular unit. The other was the wide range of voltage adjustment. We do not want solar if the battery is very low, as there’s a possibility that the solar output will not be sufficient. Likewise, if the sun’s out, we need the mains to keep the battery topped up. The solar output is nearly always above 15V when the sun is up, so there’s our first clue. We can safely get to 12.8V before things start going pear shaped on the cluster, so we can use that as our low-voltage safety net. If both of these conditions are met, then it’s safe to turn off the mains power and rely on solar only. We need a +5V signal when both these conditions are met. This very much sounds like the job of a dual-comparator with diode-OR outputs pulling on a 5V pull-up. Maybe a wee bit of hysteresis on those to prevent flapping, and we should be good. Unfortunately, to do that, I need to unscrew terminals to feed some wires in. I don’t feel like doing that just now… we’re packing up to go away for a while, and I think this sort of job can wait until we return. In the meantime, I’ve done something of a hack. I mentioned the PSU is adjustable. I wound Vfloat back to 12V… thus Vboost has gone to 12.8V. 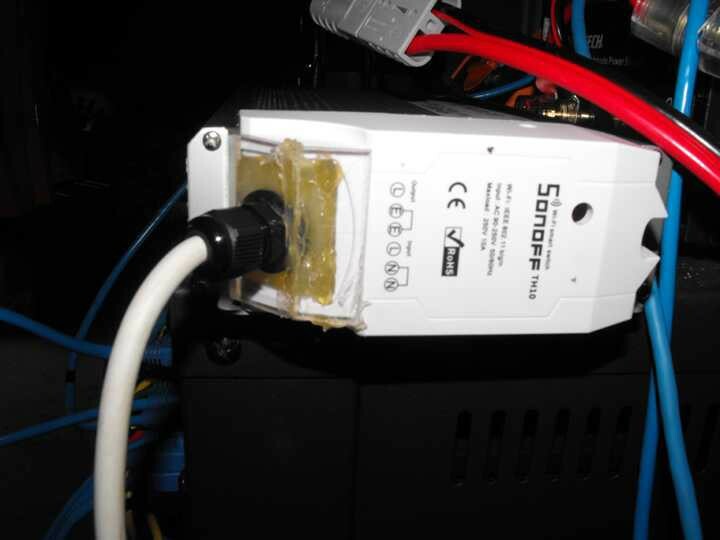 Right now, the mains PSU is showing a green LED, meaning it is in floating mode. We have good sun right now, and the solar controller is currently boosting the battery. 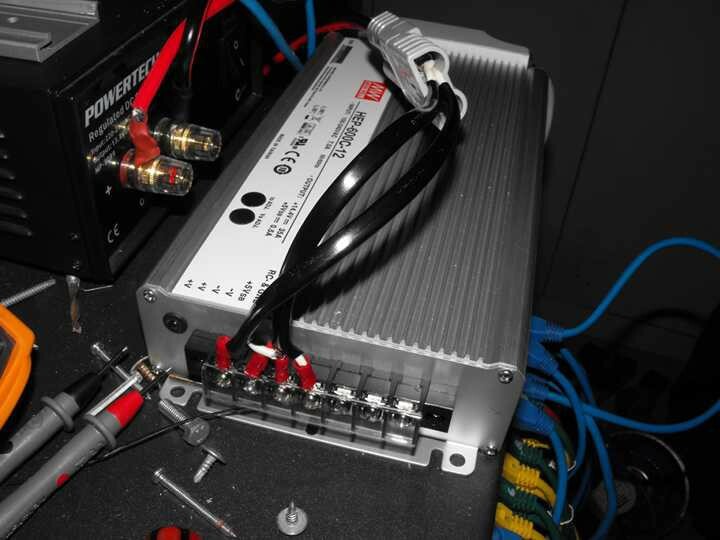 When the battery gets low, the charging circuitry of the mains PSU should kick in, and bring the battery voltage up, holding it at 12.8V until the sun comes up. I’ll leave it for now and see how this hack goes. On other news… I might need to re-consider my NTP server arrangements. I’m not sure if it’s a quirk of OpenBSD, or of the network here, but it seems OpenNTPD struggles to keep good time. Never tried using the Advantech PC as a NTP server until now, and I’m also experimenting with using my VPS at Vultr as a NTP server. Both are drifting like crazy. I have a GPS module lying around that I might consider hooking up to the TS-7670… perhaps make it a Stratum 1 NTP server on the NTP server pool, then the Advantech can sync to that. This won’t help the VPS though, and I’m at a loss to explain why a Geode LX800 running on an ADSL link in my laundry, outperforms a VPS in a nicely climate-controlled data centre with gigabit Internet. But at least now that’s one less job for my aging server. I’ve also moved mail server duties off the old box onto a VM, so I’ll be looking at the BIOS settings there to see if I can get the box to wake up some time in the evening, let cron run the back-up jobs, then power the whole lot back down again, save some juice.